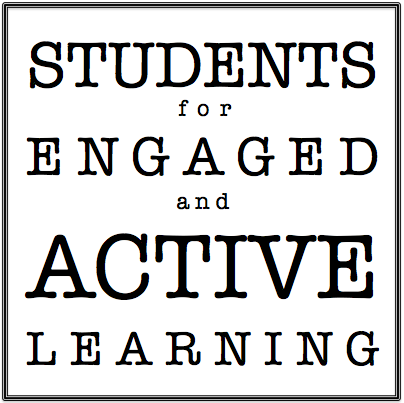 We are Students for Engaged and Active Learning (SEAL), a coalition of undergraduate students, graduate students, and alumnae of the University of California, Berkeley. Our mission is to call on our school to prioritize education by providing opportunities for hands-on engaged learning, and to fulfill its mission as a public university by expanding opportunities for community-driven research serving community needs. We not only ask for this innovative vision, we are actively engaged in creating this reality. At UC Berkeley we have some of the brightest students and scholars in the world conducting critical research and producing quality papers. At the same time, there is an amazing, resilient community with decades of on-the-ground experience. However, this knowledge is often inaccessible. Many times students’ research papers do not leave the desk of the graders. Community members often do not get the opportunity to share their expertise or their stories because of a lack of dialogue with the community and restrictive institutionalized processes. Even if research does get published, journals are often too expensive for the general public. Knowledge and information, like land and natural resources, are being privatized with fervor. Moreover, through the past half-century, the defunding of the University of California has gone hand in hand with increased corporate funding, shifting research and education towards commercial interests. As a way to resist this privatization we are introducing Commons Sense! 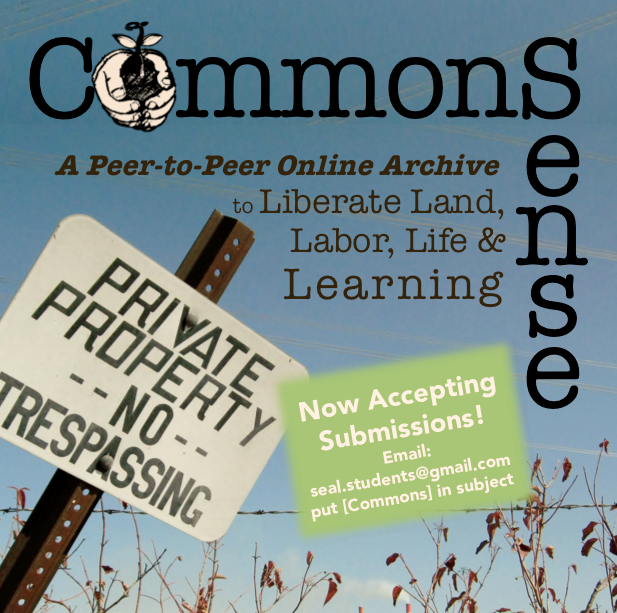 Commons Sense is a peer-to-peer wiki online archive to Liberate Land, Labor, Life and Learning as it relates to the University of California. This is about commoning the UC and re-appropriating its purpose to meet the people’s needs. This project is for everyone as the implications of the UC affects all of us. Commons Sense is a collaborative effort through all the stages of production, from knowledge creation through publication. Its goal is to serve as a free and open database and archive of knowledge relating to the protection of the commons and our public university. Topics could relate to the Gill Tract, Richmond Bay Global Campus, Tuition Hikes, Divestment campaigns, and any other topic you feel is relevant to the struggle. Submissions will be divided into different categories: research papers, historical essays, primary sources, and personal accounts. Examples of submissions could include impact evaluation report of the construction of the Richmond Bay Global Campus, a historical essay of student protests, a research paper on sustainable urban agriculture, an analysis of zoning laws, a personal story of the involvement in a coalition, photographs from Occupy the Farm, an info graphic of the UC budget or any other knowledge you would like to contribute. You do not have to consider yourself a scholar to submit an entry as knowledge is valuable in different forms and everyone has their own story. 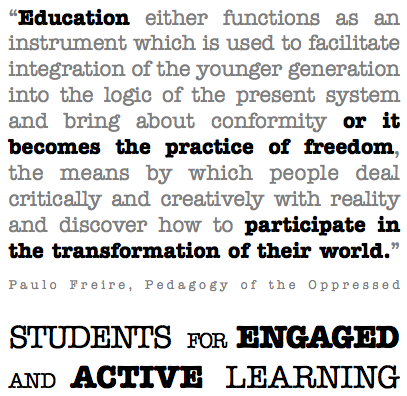 Students– engage actively with your work outside the classroom, show the world what you feel passionate about, and protect your public university. Educators– continue to contribute to the growth of your students and help keep education accessible and universal. Community members- share your on-the-ground knowledge and experience and keep fighting for your rights. Please email seal.students@gmail.com with submissions. We will notify you as soon as the archive is released online. Please share with your friends, co-workers, students, teachers, networks, and whomever you think would be interested in contributing to this project. Commons Sense is a peer-to-peer wiki online archive to Liberate Land, Labor, Life & Learning as it relates to the University of California. It is a collaborative effort through all the stages of production, from knowledge creation through publication. Its goal is to serve as a free and open database for research relating to the protection of the commons and our public university. It invites students, educators, and community members to share their stories, research, primary sources, essays, images, or other information they may find valuable. What is the purpose of Commons Sense? Commons Sense was created because we saw a need for documenting information and making it more accessible to make sure we are educated in our activism. So often the dominant narrative of the university silences and makes other perspectives invisible or they are lost through the generations. Furthermore, as the University of California is increasingly funded by corporations and has shifted education and research towards commercial interests, we believe that Commons Sense provides a medium to resist against the privatization of our knowledge and builds community power. Is the information of Commons Sense neutral and balanced? No, Commons Sense does not claim to have a neutral and balanced perspective but rather hopes to amplify stories and voices that are dismissed or excluded from the dominant narrative. All voices have a bias (The University of California is biased- surprise!) but some voices are heard louder than others. Commons Sense provides an opportunity for those who do not usually have a medium to share their information. How can I believe the information found on Commons Sense? Each entry is labeled according to type: research paper, historical essay, primary source or personal accounts. Research papers and historical essays have citations that you can refer to. Primary sources and personal accounts are authentic pieces of history. Who owns the content on Commons Sense? Can I contribute? How do I do it? Yes, absolutely! Send an email to seal.students@gmail.com with your submission. Please refer to How to add an entry for more specific instructions.